Our two sons gave our daughter her first cookbook. It was Betty Crocker's 4-ingredient Dinners cookbook. This was many year's ago when it was hard to find cookbooks that had simpler recipes that also included calories. The boys got it for their sister primarily because each recipe only requires 4 ingredients and when you are learning to cook, simpler is better. Honestly the book wasn't used much at that point. It is only in the past year she has started to cook more. The book stayed on the shelf until recently. It is always nice to revisit old friends. 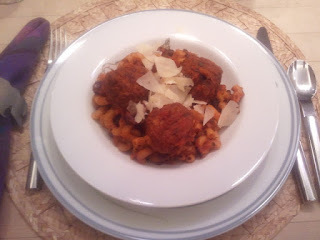 This One Pan Pasta recipe caught my eye, again (see September 25 blog) because I wanted to use up some frozen turkey meatballs I had in the freezer. The great thing about most of the Betty Crocker recipes is that they tend to use ingredients you can store in your pantry to have on hand when needed. The One Pan Pasta and Meatballs is a good example. You use spaghetti sauce from a jar, a can of ripe olives and elbow macaroni from a box. The meatballs, as mentioned, come from a bag in your freezer. Each serving has 520 calories. Not the least caloric meal but not the worst either and for a quick and easy meal, you can't beat it! We rounded out the meal with a tossed green salad with low calorie dressing. The total calories for the meal was 580. Perhaps not my most favorite spaghetti recipe but a good stand by. It will be repeated!